← On Jan. 29th, Come Brighten the New Year With Us! 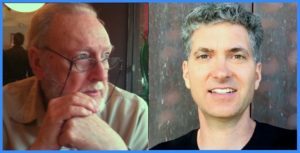 Jim Story & Matthew Lansburgh -Tuesday, Dec. 4th at the Cornelia St. Café! Hello, all! I hope you’ve had a sparkling Thanksgiving holiday weekend! It was certainly a cold Thanksgiving Day here in NYC! But here’s something that will warm your holiday season no matter what the weather! On Tuesday, December 4th I’ll be reading at the Cornelia Street Café. This time I’ll be reading with Matthew Lansburgh, winner of the 2017 Iowa Short Fiction Award for his linked story collection, Outside is the Ocean. Matthew’s fiction appears or is forthcoming in journals such as One Story, GlimmerTrain, Ecotone, Epoch, Electric Literature, StoryQuarterly, Columbia, Michigan Quarterly Review, Shenandoah, and Guernica. Matthew’s collection has been called “mesmerizing” by Andre Dubus III. I’ll be reading from two new works, The Condor’s Shadow—my novel of twisted courage and a struggle for connection—which is scheduled for publication in 2019, plus from a collection of linked fiction called Soil, Sand, Stories, based loosely on my childhood. And—of course—from my novel, Problems of Translation, which has been dubbed “An insanely amusing adventure” (Gary Shteyngart). The date is December 4, a Tuesday; the time is from 6-7:30 pm; it’s at 29 Cornelia Street, and as usual, the Café’s cover ($10) will include a free glass of wine. Check out the reading’s Facebook event page, the Café’s website or jimcstory.com.